Click “HS password” to use your HS password to log in. If you are a new employee or this is the first time you log in to the Password Manager, select this option to log in. NOTE : After 3 unsuccessful login attempts, your Password Manager access will be disabled. 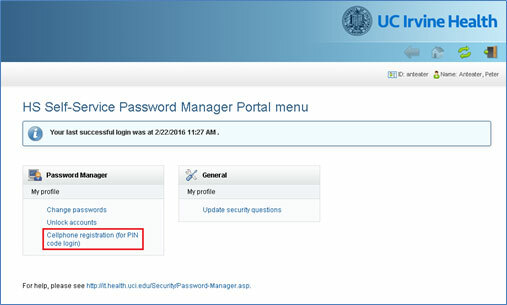 Please wait 5 minutes for it to auto-enable to retry, or contact Service Desk to unlock your Password Manager access. If you are a new employee, your initial password is your 4-digit birth year (YYYY), followed by the 1st letter of first name in uppercase, then the 1st letter of last name in lower case, and your birth month in two digit format. After logging in, you will immediately be asked to create your two (2) security questions. The security questions can be used to identify you to the HS Service Desk personnel and allow you to log in to the Password Manager if you forget your HS password. NOTE : Your security questions could be updated anytime. 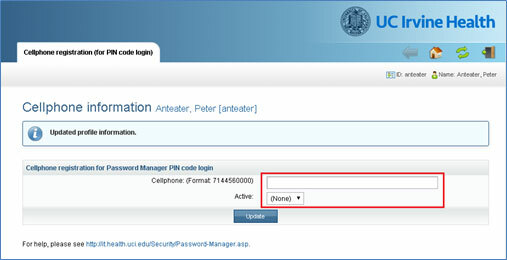 Enter your 10-digit cellphone number, select “Yes” in the Active: field, and click “Update”. At any time, you can DISABLE cell phone for PIN code login by 1) select “(None)” in the Active: field, OR 2) leaving the Cellphone field empty. Click “Update” to save the changes. Click “Answer security question” at log in menu. You should receive a PIN code on your registered cellphone within minutes from 1(714)266-6766. The PIN is for one-time use and will expire after 60 minutes. Enter a new password that meets the complexity requirements. Enter the same new password in the Confirm box. Then, click “Change Passwords” to save your new password. 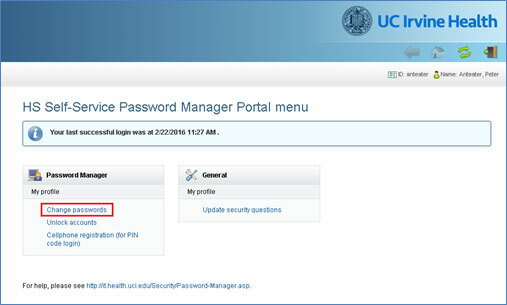 NOTE : Password Manager is used to synchronize your UCI Health HS account password with your UCInetID password. 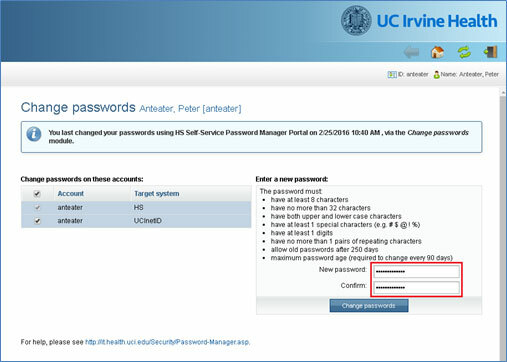 However, the first time you change your password, you may receive an error that NOT ALL system passwords were changed. This is because your UCInetID has not been activated. 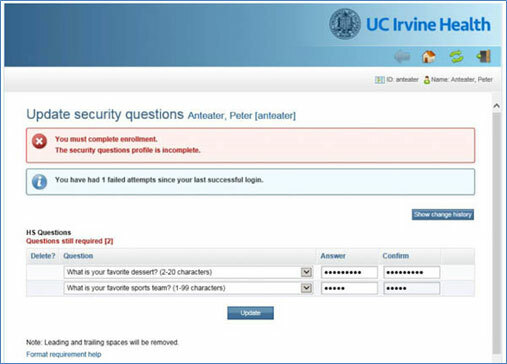 Please go to https://activate.uci.edu to activate your UCInetID or consult the UCInetID documentation. 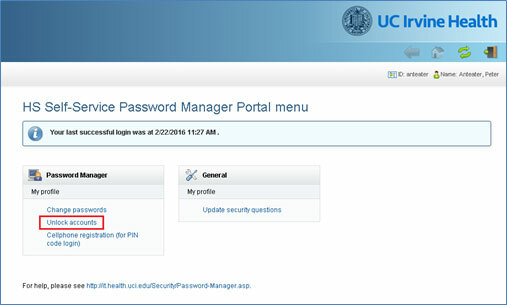 To synchronize your HS password with the UCInetID passwords, be sure to keep the UCInetID checkbox checked. Section 7: Un-lock your HS account. If you get locked out of your HS account, e.g. too many failed login attempts, you can unlock it using the Password Manager. You will need to use your security question or a PIN code to log in to Password Manager. Please see Section 4 Log in using Security Question and Section 5 Log in using PIN code. You should see the following success message when your account is un-locked. When you are finished with the Password Manager, exit your session by clicking on the exit door icon on the top right corner. You may close your web browser.